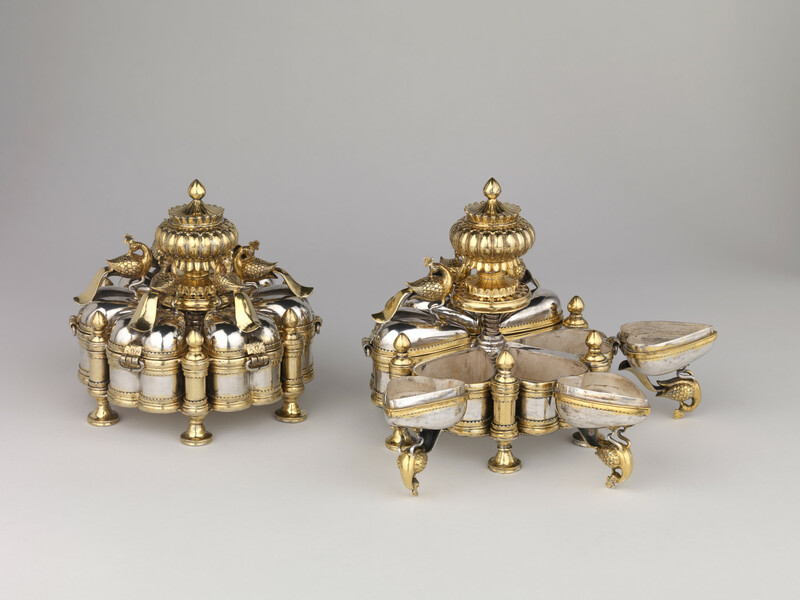 A pair of silver and silver-gilt betel-nut boxes, or paandans, divided into six heart-shaped compartments. The hinged covers of each compartment are surmounted by peacocks and close by one central screw-knob. Paan is a mild stimulant usually offered at the end of formal assemblies in India and is made of shavings of areca nut, various seeds and spices, lime paste and occasionally tobacco wrapped in a betel leaf. The separate compartments of these paandans are designed to hold the individual ingredients used to prepare paan, and the hinged lids are shaped to resemble betel leaves.